Home Cooking Tips DO ONIONS MAKE YOU CRY? I’ve tried a lot of things to keep from crying when I chop onions, like holding (unlit) matches in my teeth, putting the cutting board near an open flame, or chopping the onions under running water. I’ve even considered wearing a snorkel, a trick I learned from an artist friend to keep from inhaling the toxic chemicals we used for cleaning the ink from our silk-printing screens. The only thing that ever really kept my eyes dry was getting someone else to chop my onions for me. I just learned a better solution from my friend and fellow IACP member, Carol Dearth. Chef Carol has a gorgeous cooking school and store in Bellevue Washington called Sizzle Works Sizzle Works. She also has a terrific blog where she posts recipes and cooking tips. Her last e-letter included a link to her new video about onions. Her secret? Vinegar! Just splash a little on the chopping board and slice and dice away – no more tears or red eyes. Thanks, Carol! Carol explains why the vinegar works and demonstrates how to select and chop onions here. Carol Dearth, No Tears, Peeling Onions, Sizzle Works, Vinegar. Bookmark. I keep my onions in the fridge. I don't have a problem with them burning my eyes when I cut them now. I can't believe people have so much trouble cutting onions. If you have a downdraft stove, turn on the fan, place you cutting board next to the stove area and cut as many onions as your heart desires. A fan positioned to divert air away from the onions will also work. chop onions to my heart's delight with no tears! Anonymous: you must not have very sensitive eyes. A fan never helped me much if at all. Thanks for the post and link to the video! I never realized that sweet onions had a different shape than the yellow or other onions! Looks like I've been cutting my onions the wrong direction too. 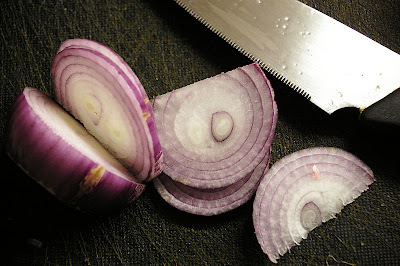 I'll give the vinegar a try, along with this cutting style, the next time I need an onion. Thanks for the comment, Sandi!